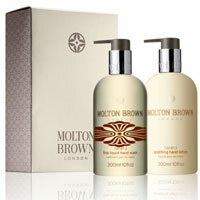 Molton Brown soap, shower gel, lotion and fragrance list. Indulge yourself with our luxury hand care products, each bursting with fragrant essential oils and plant extracts. Choose depending on your mood, taste or colour scheme with a range of options infused with sweet neroli orange blossom, Moroccan pomegranate, cool elemi and spicy green Kaffir lime leaf. Escape the ordinary with our luxurious bath and body range. Made in England with ingredients sourced from around the world, discover our soaps, body washes and body care products, all designed to get you where you want to be. Packed with body boosting benefits and will also enhance your mood. Revive your grooming routine with our essential men's shaving, hair, body, sport and skin care products. Why not indulge your senses with our spicy re-charge black pepper collection: our popular range featuring body lotion, eau de toilette, scented candles and the award winning re-charge black pepper body wash.
Molton Brown bath and body care: Molton Brown was founded in London in 1973. Their body and fragrance products are synonymous with English luxury. 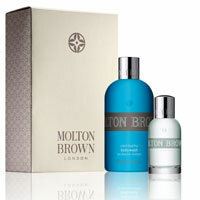 Learn more about Molton Brown perfumes and Molton Brown home fragrances.